There is a point of view among some soccer fans that the sport is unassailably other. I assume that since I used the word “soccer” in the first sentence, those fans are gone now, and I can talk to the rest of you. Because here’s the thing: The idea that the ineffable foreignness of soccer is best left to continents like Europe and South America — because all us Yanks will do is take away its beauty, what with our “stats” and “analysis” — is no more than a steaming pile of merde. All those things that go on around the game don’t make it fundamentally different from other sports. It’s an athletic competition, and as such, it has certain things in common with every other type of athletic competition. The fact is, Nerdy American Sports Fan, you know way more about soccer than you realize. All those sports you already follow — your football, your basketball, your baseball, all those things you already debate, and fight over, and spend hours reading about when you’re technically supposed to be working — apply to soccer as well. You can already speak the language of soccer nerd-dom, you just need to learn the dialect: the lineup formations, field spacing, shot selection, tactical chess moves, one-on-one battles, even analytics. They’re all there. You just need to know where to look. And so, with this summer’s World Cup just around the corner, it’s time for you to find out just how much you already know about how soccer is played. Soccer lineups are presented in much in the same way defensive football lineups are. Football has linemen, linebackers, and defensive backs; soccer has defenders, midfielders, and attackers, although soccer adds a wrinkle by sometimes splitting the midfielders into two groups. Instead of calling a formation a 4-5-1 (four defenders, five midfielders, and a striker), it may get called a 4-2-3-1, 4-4-1-1, or a 4-1-4-1 in an effort to more accurately describe what’s going on. That’s where things get complicated. One of the things football gets right and that soccer struggles with is separating the personnel on the field from the tactical roles those people are asked to play. In football, a 4-3 defense is always a 4-3 defense, even if a safety spends the entire game parked on the line of scrimmage as part of an eight-man front. And you wouldn’t ever call a middle linebacker a “defensive back” just because he happens to spend a few plays dropping back into coverage and flailing at Jimmy Graham running a seam. It’s personnel first, tactical role second. It’s quite possible you could see two soccer teams that look nothing alike but are both nominally playing a 4-3-3 — one defensive and one offensive (Spain and Brazil, for instance). And in other circumstances a 4-2-3-1, 4-4-1-1, and 4-3-3 will look virtually identical. It’s not the players, it’s what you do with them. It’s not the players, it’s what you do with them. To get a sense of how a team is playing, there are a few things to look for in a soccer lineup, with an occasional third thing to double-check. Question 1: Are teams employing two or three central defenders? Most teams play with two, but occasionally a team will play with three. Having three center backs doesn’t necessarily make a team more conservative,1 but it does affect the way in which it will play. Question 2: How many strikers are on the pitch? Two strikers used to be the norm. Increasingly, the top teams in the world are playing with a single player up top. It’s a harder question to answer than the first one because there are some players who can function both as a striker and as an attacking midfielder. England’s Wayne Rooney is a good example of someone who floats between those two roles. If this isn’t complicated enough, every once in a while a team will basically play without a striker. If Spain does this at the World Cup, as it has on occasion, feel free to throw your hands up in frustration and scream at the heavens about the absurdity of positional definitions in the modern era. Question 3: Are there wingers/wide midfielders? Usually the answer is yes. They’re the wide receiver types: prima donnas with fast, tricky feet who often fall over at the slightest bit of contact and can frequently be seen arguing with assistant referees. Answer those three questions and you’ll have a general idea about what kinds of players are on the field. What it actually looks like when they play is another question entirely, and it’s one more informed by tactics than by personnel. Imagine that a soccer team is like a football team in pass protection. At any given moment, that football team has two objectives: protect the quarterback and advance the ball down the field. Now, I grant you this metaphor is imperfect, and it breaks down precipitously in soccer’s midfield area, where players are simultaneously attacking and defending, and interchanging positions, and doing all the wonderfully complex things that make soccer soccer. But the idea of goalkeeper as quarterback, protected by his offensive line of central defenders, works quite well. By that logic, a team’s full-backs2 are its tight ends. That’s Spanish left back Jordi Alba in the finals of Euro 2012 against Italy. Part of Alba’s license to roam forward comes from the fact that fellow full-back Álvaro Arbeloa could be considered more Bubba Franks than Jimmy Graham. Arbeloa won’t be at this World Cup, but his replacement, Chelsea’s César Azpilicueta, will likely fill Arbeloa’s conservative role. It’s certainly possible for teams to be dangerous attacking threats with one stay-at-home full-back, but if a team runs out a double-Bubba lineup, it’s a clear indication that it’s planning on battening down the hatches and weathering a storm. Playing in the wide areas of a soccer pitch is important for an attacking team in the same way that having jump shooters on the court is important for a basketball team. In both sports, spacing is what makes offenses tick. Without good shooters, NBA defenses can sag into the lane and prevent high-percentage shots at the basket. 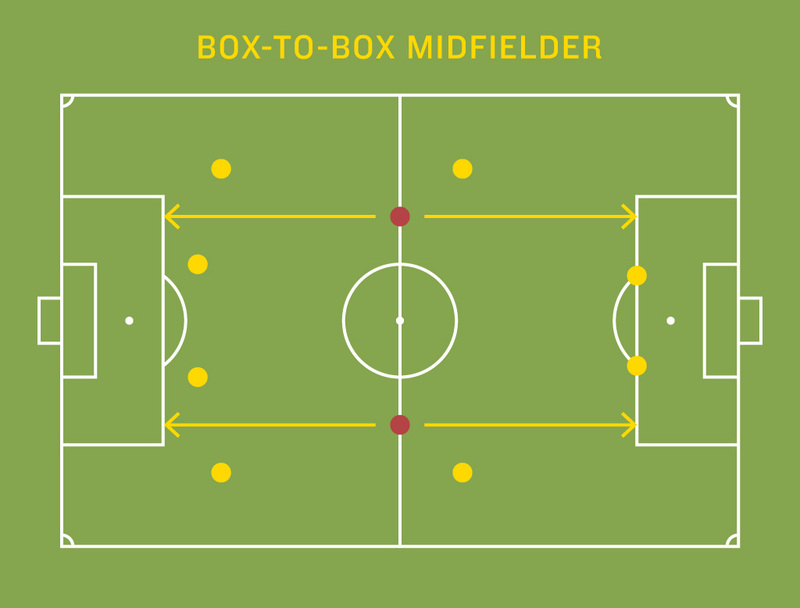 Similarly, without players who can apply pressure from wide positions, defenses can sit close to their own goal and crowd the areas where forwards and attacking midfielders like to operate. Traditional wingers play on the same side of the field as their stronger foot. Inverted wingers play on the opposite side. As a guiding rule, this shapes their primary function, and consequently how they interact with the full-backs who share a sideline with them. Traditional wingers stay in wide areas with an eye toward crossing the ball toward the middle. Inverted wingers tend to move into more central locations, as shooters or playmakers. There are exceptions, of course — notably, Thomas Muller of Germany, a right-footed player who gets goals by drifting in from his right wing spot. But in general, traditional wingers stay wide and cross the ball into the box for goals. Here is Edinson Cavani4 providing the cross for a traditional headed goal by Luis Suárez. Arjen Robben of the Netherlands, Muller’s Bayern teammate, also plays on the right, but he is the quintessential inverted winger. He gets the ball on his right, cuts onto his stronger left foot, and shoots. Rinse and repeat and repeat and repeat. Think of an overlapping run like a pick-and-roll in basketball. Sometimes the point is to create space for the full-back so he can do something awesome. One of the most iconic goals of the last World Cup came from an overlapping run by the great Brazilian right back Maicon, against North Korea. It’s all about the position Maicon got into before hitting that ridiculously angled shot — that’s what the overlap is designed to achieve: getting the full-back rolling toward an extremely dangerous area of the field. Full-back play is fun to watch, but on many teams it’s a secondary tactic. Most sides keep traditional wingers on the outside, perhaps supported by occasional overlaps, and make sure their full-backs don’t get caught being too aggressive. After all, if the full-back is trying to pull a Maicon and loses the ball, the resulting space he leaves unprotected can lead to a catastrophe. What exactly is a good shot in soccer? The nascent field of soccer analytics is hard at work trying to figure that out. It won’t surprise anybody to learn that closer is better, and using your feet is much, much better than using your head. So, much like getting into the lane is of paramount importance in basketball, getting the ball at your feet in front of the goal is just about the best thing you can do in soccer. Getting to the byline (baseline) in the corner of the penalty areas (like where Maicon was in the above video) is a hot destination. That’s where you can cut the ball back for a teammate to have one of those coveted close shots. Hey, look at that — it’s like basketball again: Get to the goal or get to the corners. In 32 games at the 2010 World Cup there were 134 non-penalty goals scored.6 Of those, 80 were scored from a player’s feet and inside the penalty area. That’s a cool 60 percent. However, of the 1,816 shots taken, fewer than a third (568) were either left- or right-footed shots in the area. In other words, it’s hard to get those shots, but when a team does, it greatly increases its chances of scoring. By this point you may have noticed that I am, quite literally, skirting around the edge of what happens on a soccer field. We’ve gone from full-back to winger to crossing and shooting, but we’ve ignored the center of the field. That’s because the middle of a soccer field is a mess. We’ll start the farthest forward and work back. This is traditionally the offensive playmaker (and wearer of the jersey no. 10). They are very much the point guards of the attack. The idea is to get into pockets of space behind the opposing midfielders and in front of the defenders and make stuff happen, either for themselves or for others. The traditional no. 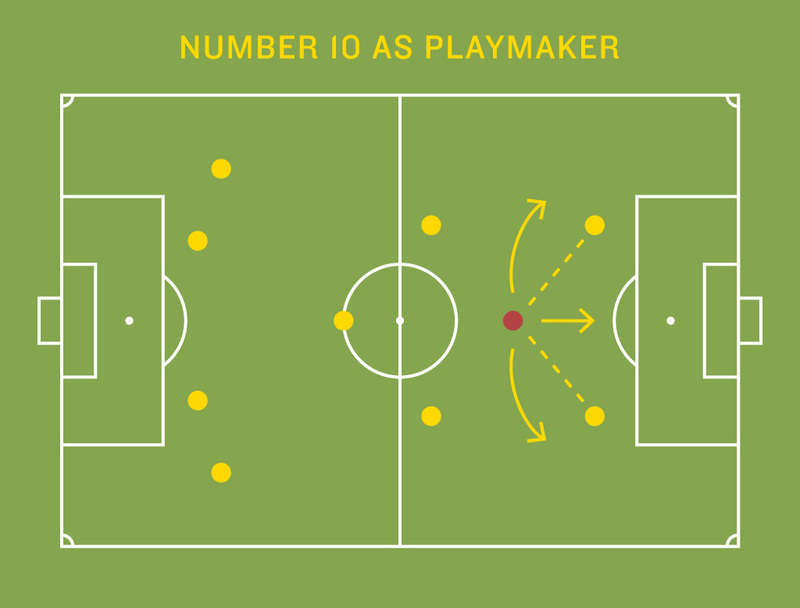 10 role is really just shorthand for naming the main creative playmaker, whether that player starts in a pocket of space or moves there, either from the striker position, a wing position, or even consistently from a deeper midfield position. So-called because they defend in their own penalty box and attack their opponent’s penalty box. It’s a very clever name. Often, teams will deploy two of these players together centrally, with the understanding that they’ll cover for each other. If one is getting forward in attack, then the other will position himself to cover. The United States will often deploy Michael Bradley and Jermaine Jones that way. If a system is described as 4-4-2, and it genuinely is two strikers, then it’s usually safe to assume the two central midfielders are box-to-box guys. They have the extra burden of getting forward from midfield to provide support for the strikers in the only system without a create hub. Chile’s Arturo Vidal is probably the best box-to-box midfielder in the world, and the closest thing soccer has to LeBron James. That’s not to say he’s the best player. But Vidal does have a wider range of elite skills than anybody else in the game. Have a central defender injured? No worries, Vidal is your guy. Need a player to make a couple of simple passes and settle your team down? He’ll do that. Need a guy to step in and make an interception to win the ball back? That’s right in his wheelhouse. How about running from deep in the midfield into the penalty area to create a goal-scoring opportunity? You bet. Or a midfielder with the skill to finish with a little first-touch chip? Vidal does that, too. Would you like to see him do all those things in the space of a minute? I thought you’d never ask. You’ll probably want to watch that one again. A defensive midfielder might occupy the same space on the field as a deep-lying playmaker, but his role is decidedly different. Like Dwight Howard covering for lapses in the perimeter defense, a DM’s primary job is covering for his fellow midfielders and full-backs when they get caught attacking. Spain’s Sergio Busquets is probably the best in the world — although given his well-rounded set of skills, it seems a little dirty reducing him to “just” a defensive midfielder — at stopping opponents’ counterattacks before they get started. Argentina, with its wealth of attacking players, may well deploy Javier Mascherano in a similar role (though he might also play in central defense), and Belgium has the mightily Afroed Marouane Fellaini. Got all that? Like I said, the midfield is a messy mix of players running at cross purposes, with skill sets designed to complement their teammates and stifle their opponents. When it works it’s a thing of beauty, or at least effectively gums up the other guy’s thing of beauty. Either way, it’s often the most influential part of the field. When you watch a team play defense, you must ask yourself: “What are they trying to accomplish?” In football, a prevent defense isn’t failing if it allows an opponent to drive down the field. In basketball, a perimeter defender asked to shuttle his man toward baseline help isn’t at fault if that help arrives late. So the idea is to figure out the defensive game plan and then assess how well a team is executing it. There are three main things that can really hurt a defense: letting attackers get behind the defense,8 leaving space between the midfielder and defenders for an opposing playmaker to exploit, and not pressuring the ball, which leaves deeper-lying playmakers the time and space to pick out passes. The tricky thing, of course, is that it’s basically impossible to do all three things at the same time. Different teams have different ways of getting around this. Here’s what to look for. Rick Pitino would feel right at home coaching Spain. The reigning World Cup champions fight to regain possession as soon as they lose the ball. Spanish attackers press the opposing team heavily, the midfielders press upfield to take away passing options, and the defenders play a high defensive line. In theory, Spain’s weakness should be the space the defenders leave behind. There’s an awful lot of room for an attacker to run onto a good long ball and wreak havoc. In practice, Spain is so good and so organized at pressing that teams almost never have enough time or space with the ball at their feet to play that killer pass. At a national team level, the Pitino-style swarming press is extremely difficult to execute. It requires an understanding between teammates, much more likely to exist at the club level than at the country level. Some squads will start off with an aggressive press before dropping into a more conservative defensive stance 15 to 20 minutes into the game. Still others will apply some light pressure when they lose the ball in an attempt to slow their opponent’s transition game down while their defenders get set up in their preferred locations. If a team is an underdog, chances are its defensive line will be set extremely deep in its own half, often all the way back on the edge of its own penalty area, with a row of four midfielders close in front of them. In this setup, even attackers will drop into their own half of the field to help defend, putting “10 men behind the ball.” The idea is to let your opponents keep possession as much as they want, just not to let them push it over the goal line. There are a couple of drawbacks to playing so conservatively. First, you decrease your own chances of scoring. With so many players playing so deep, it can be very hard to keep the ball once you win it. You are inviting the other team to press. It’s like playing max protect for the quarterback while forgetting to have the wide receivers run routes. Teams that defend deep need a strong forward who can receive and hold the ball, keeping possession while his teammates make the long trek up the field. It’s a tough, thankless job. Didier Drogba is great at it. How many times does Chris Paul appear to get punched/clawed/clotheslined and otherwise battered about the head and shoulders in a game? What if there were only one referee to officiate whether he was faking or fouled? Now imagine that a foul in the lane meant Paul got a free throw worth 30 points. It doesn’t have to be a shooting foul — any old reach-in, grab, or hold will do. Imagine how often Paul would go flying when he got into the lane. And again, imagine one referee had to handle it all. This is pretty much what happens in soccer. There’s only so much one person can do when charged with officiating the whole game. It’s no wonder con jobs are so effective, and with the rewards being so bountiful — a penalty, or having an opposing player sent off — it’s no wonder players do so much conning. The argument surrounding flopping becomes a moral one. Should players do it or shouldn’t they? There’s a general understanding that it’s impossible for referees to correctly identify the flops from the fouls, the genuine elbows from the dramatic head tosses. The fact that this isn’t a red, yet this somehow is says as much. So, yes, there’s a lot of flopping in soccer. No, that’s not because it’s different. It’s just easier to get away with. And when you do, you get a lot more for your team. Can it be off-putting? Absolutely. Should the sport do a better job of combating it? Without a doubt. Does it make the game fundamentally different from other sports? Not even a little. So there you go. From first kick to last flop, hopefully when World Cup 2014 kicks off, you won’t see a mysterious mass of chaos different from the way you’re used to consuming sporting content. Soccer is unique and unpredictable, full of moments that border on art and blunders that go well beyond comedy. It’s a contest full of contrasting styles and fluke moments that defy comprehension. It’s awesome. Just like every other sport you watch. Enjoy it. Just like playing 4-3 instead of 3-4 isn’t really designed to stop the run by having more linemen, it’s just a tactical choice. In the linguistic battle between soccer and football, soccer gets full-back. With all due respect to the Hynoski family, full-backs are an afterthought in football — in soccer they can be key. Lahm has spent a large part of the last year with his club team Bayern Munich being used in the midfield. It remains to be seen where he will end up this summer for Germany. Despite being one of the best forwards in the world, he spent much of the 2010 World Cup playing right wing thanks to the presence of Luis Suárez and Diego Forlán ahead of him. Technically, it happens when they get to the outside of the winger; when they actually cut inside the winger more centrally, some snooty and particular folk will insist on calling it an underlap. All statistics courtesy of ESPN Stats & Info. This is what a “false 9” is, the 9 being the striker’s traditional number. That term, though, has become so fashionable as to basically lose any meaning it originally had. It’s important to know the offside rule when talking about the line defenders are holding. Players cannot go behind the last defender until after the ball has been passed to them. Attacking teams want to play a pass right as the attacker is in line with the last defender, so that the attacker can then run onto the ball behind the defense. There are lots of tricky exceptions as well. 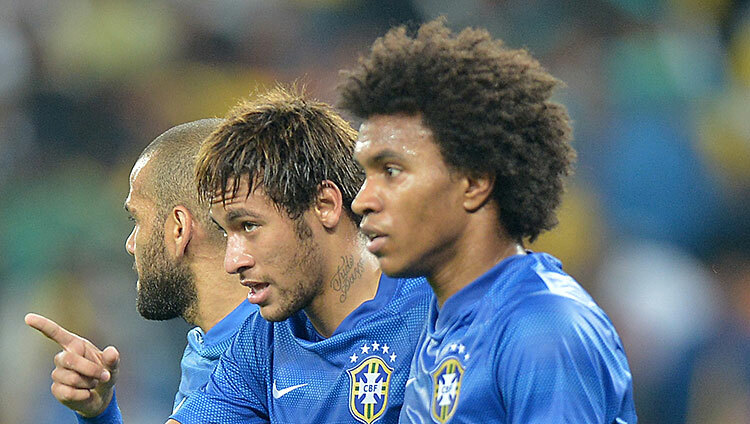 The correctness of offside calls will be debated about 537,000 times over the month in Brazil.